The late Stephen Hawking is being remembered today for increasing humanity’s understanding of our universe and the invisible forces that dictate it. And in this particular corner of that universe, he’s being remembered as one of the scientific community’s most recognizable personalities, his success in popular-science literature having translated to a pop-culture prominence that bridges the filmography of Errol Morris, the Star Trek universe, and the animated worlds of Matt Groening. 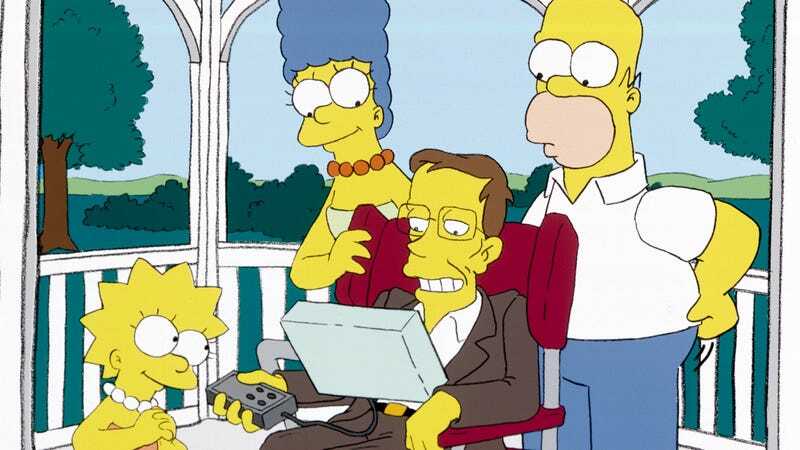 Between 1999 and 2010, Hawking made four appearances as himself on The Simpsons. As executive producer and writer Matt Selman recalls, there was a time when Hawking was an even more frequent Simpsons presence. “One year, or a couple of years, he was just hanging out—he would come to table reads and be there hanging out,” Selman told The A.V. Club during a phone interview previewing the show’s upcoming episode, “Homer Is Where The Art Isn’t.” “Like, ‘There’s Matt Groening. There’s Dan Castellaneta. There’s… Stephen Hawking. At the read. Just enjoying our world.